Selective oestrogen receptor modulators are the special group of compounds that play a key role in any of the “anti-oestrogen” treatment. Raloxifen is one of these modulators and is responsible for reducing the activeness quotient of oestrogen. The level of oestrogen in the body remains unaffected, the only difference in this hormone's activity can be expected at the level at which it works. This medication targets the receptors that would otherwise get bound to oestrogen for carrying out its action at a cellular level. When used in men, the kind of diminution in the activity of oestrogen is marked by a raise in the levels of testosterone production and activity. The anti-estrogenic effect of this medication has been suggested for a long-term use in the cases of breast cancer. Long-term use of medications calls for a bulk purchase that can prove to be beneficial with the lucrative discounts made available by the online retailer Pinnacle Peptides When used in the cases of osteoporosis, this medication is capable of reducing the risk of potential fractures too. The use of this medication has been limited to the researches that involve hormonal restriction. By boosting the levels of testosterone and insulin-like growth factor-1 (IGF-1), Raloxifen helps in tackling the health issues like low muscle strength, obesity, and impaired reproductive dysfunction. This medication plays a crucial role in the health of aging men. The hike in the levels of serum IGF-1 was achieved after the boost in the testosterone level. 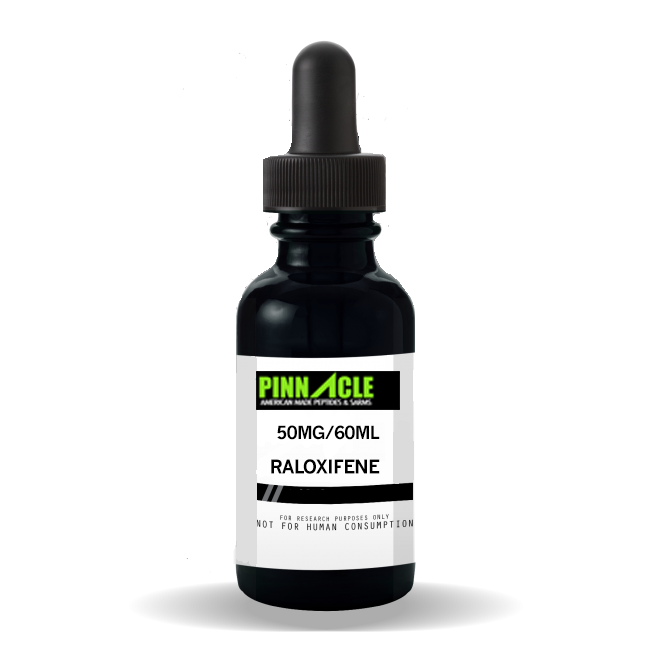 Nevertheless, the aforementioned bodily level changes can be expected only after long term administration of Raloxifene. Regular intake of this medication was found to be capable of inducing a change in the density of bone. Thickening of bone material caused by the regular use of this medication can prove to be bliss for the men who are on androgen deprivation therapy. Androgen deprivation therapy is indicated for the patients with prostate cancer. A significant number of cancerous cells involved in progression of prostate cancer were also witnessed with regular intake of this medication. It is capable of extending relief to the condition of osteoporosis in the case of post-menopausal women too. The products we offer are intended for laboratory research use only. In purchasing any of these items, the customer acknowledges that there are risks involved with consumption or distribution of these products. These chemicals are NOT intended to use as food additives, drugs, cosmetics, household chemicals or other inappropriate applications. The listing of a material on this site does not constitute a license to its use in infringement of any patent. All of the products will be handled only by qualified and properly trained professionals. All customers represent and warrant that through their own review and study that they are fully aware and knowledgeable about the following: Government regulations regarding the use of and exposure to all products. The health and safety hazards associated with the handling of the products they purchase. The necessity of adequately warning of the health and safety hazards associated with any products. Pinnacle Peptides and www.pinnaclepeptides.com reserves the right to limit and/or deny sales of products to any unqualified individuals if we have reason to believe that misuse will occur.